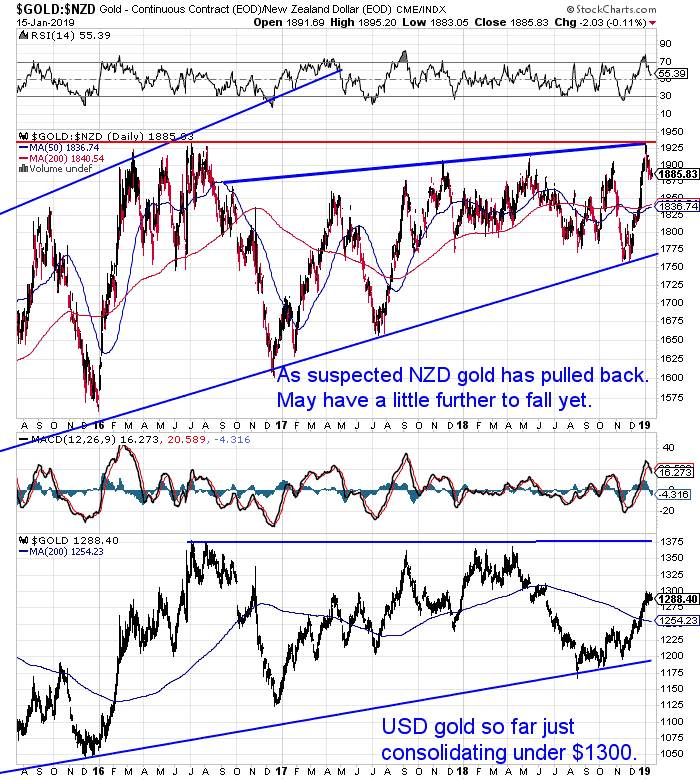 As expected gold in NZ dollars has been correcting after a strong run higher to end 2018. Having pulled back about $40 per ounce this year, it may have a little further to fall yet. Perhaps to around $1850 or even down to the 200 day moving average? But we are getting close to the buying zone now. Gold continues to make higher highs and higher lows since 2016. 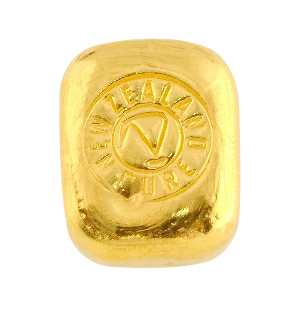 Once the 2.5 year high is broken just above $1925 there is a lot of blue sky ahead for the price of gold in NZ dollars. 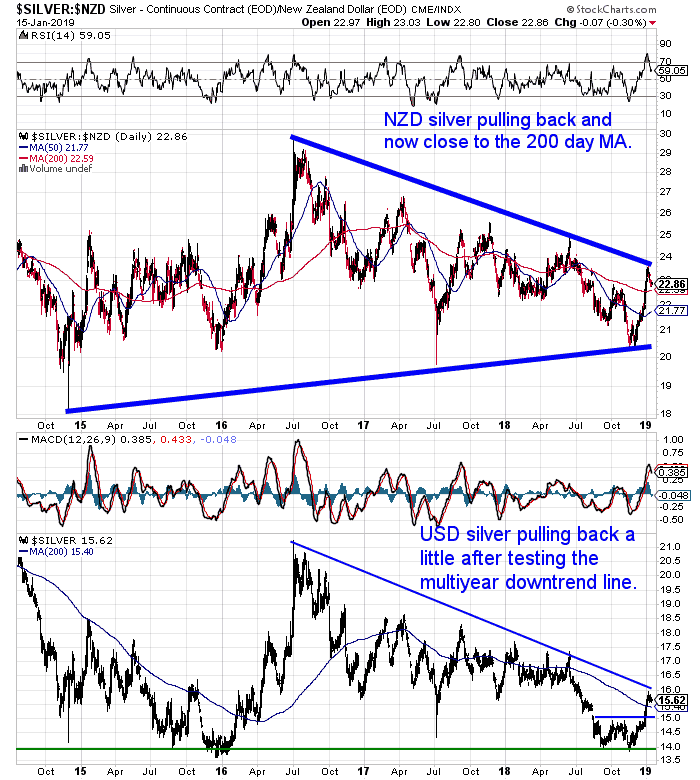 Silver is also pulling back as we thought it might after touching the multiyear downtrend line. NZD silver is now close to the 200 day MA. Maybe we’ll see it head even a little lower than that? As we said last week a move back to $22 would be about a 50% retracement of the late 2018 run higher. So a buying zone approaches for silver too. 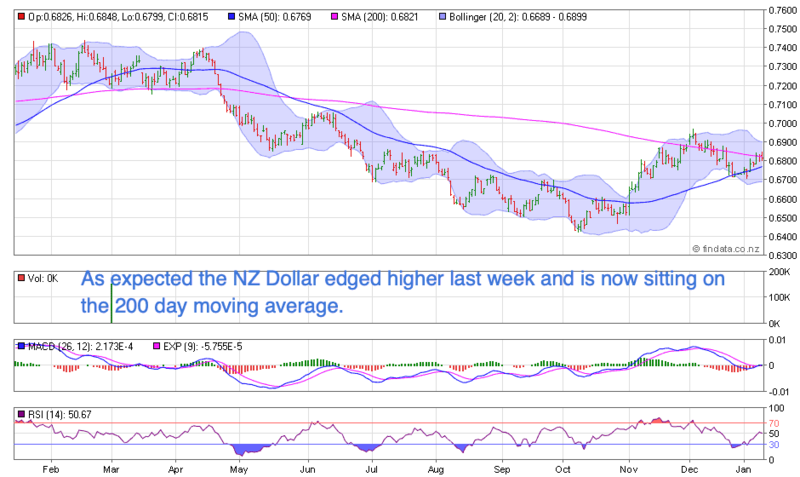 Meanwhile the NZ dollar also moved higher as we suspected it might last week. Now sitting right on the 200 day MA. In our year in review article last week we commented on how poorly most assets did in 2018. This week we’ve revisited what we think was the likely cause of this poor performance: The Fed balance sheet reduction or quantitative tightening (QT). When we first wrote about this in September 2018 we suspected it could be what causes the likes of share markets and property prices to stop their ascent. We think this may be the economic measure to watch closely in 2019. Even though the US central bank head Jerome Powell has recently talked down the odds of further US interest rate hikes this year. The data we are following shows the Fed has continued its QT at the same pace as promised. What is central bank balance sheet reduction? What was its impact in 2018? What will be the impact of QT in 2019? How might the Fed and other central banks respond? Also on the topic of poor performance of share markets and other assets is the latest article from Darryl Schoon. 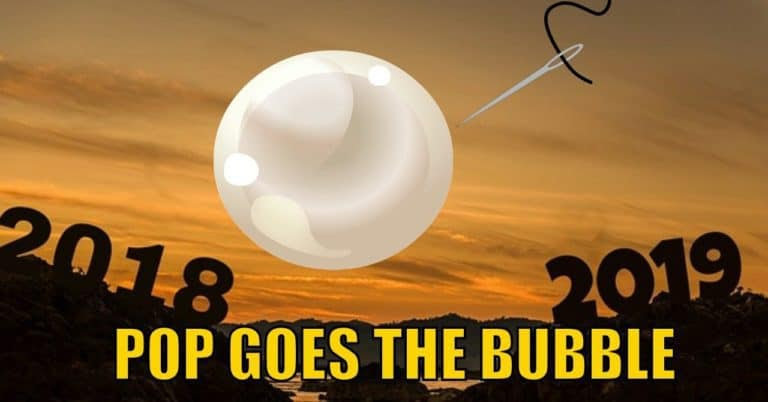 See why Darryl thinks 2018 saw the start of the popping of these bubbles and how it will continue in 2019. ANZ’s Truckometer indexes are now clearly flashing warning lights about a slower growth path for the New Zealand economy. This is one of the measures pointing to why the Reserve Bank will eventually need to cut interest rates. 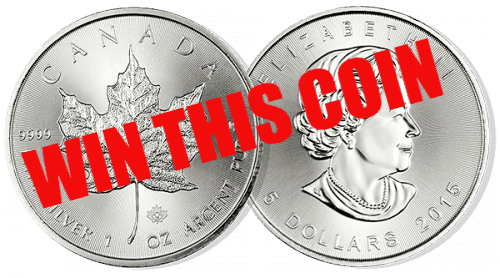 As you’re no doubt aware, silver finished 2018 strongly. But did you know it went up for 7 days straight? More importantly did you know what this has meant historically? “While stocks ended 2019 with a plunge, another asset class soared. 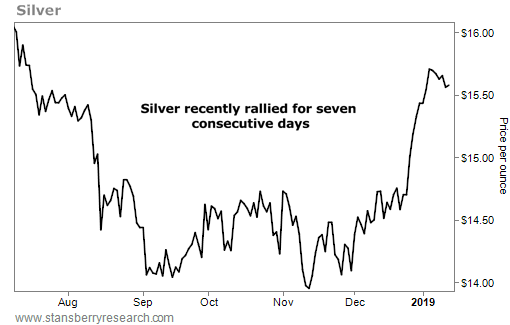 Thanks to massive uncertainty in the stock market, precious metals have moved into a silent uptrend in recent weeks. Gold jumped nearly 5% in December alone. You see, silver will always live in the shadow of gold. It will always play second fiddle. But today, overlooking this precious metal is a mistake. When an asset moves higher several days in a row, it’s often a sign that the trend is accelerating. It signals that more upside is likely. Silver had been trudging along. But that changed in December. 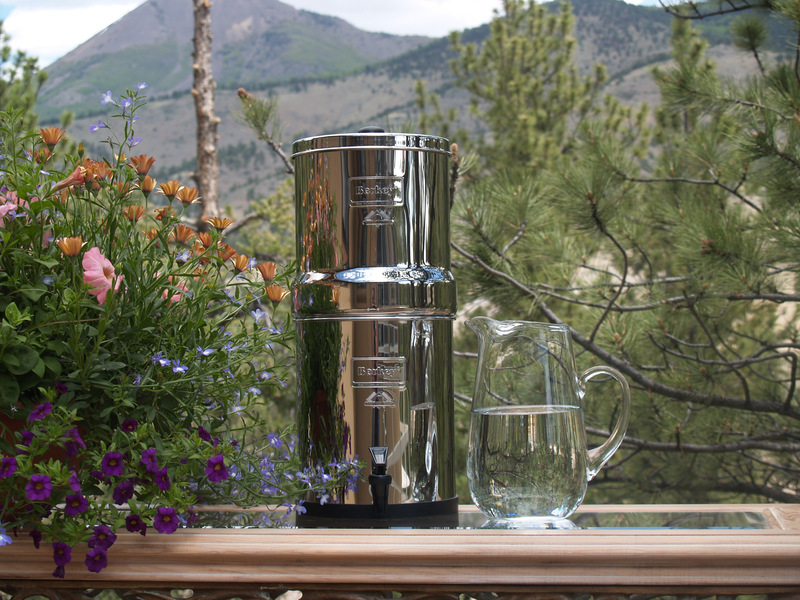 The metal absolutely soared… And it jumped for seven straight days in the process. 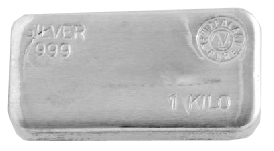 Silver has returned just 3% a year since 1975. That poor return doesn’t mean you should ignore the precious metal, though. Buying after consecutive up days tends to mean a strong uptrend is underway… And big gains have followed in times like these. Similar instances have led to 6% gains in six months and a solid 16% gain over the next year. 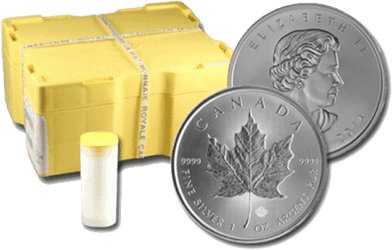 Those returns crush the typical poor returns of silver. 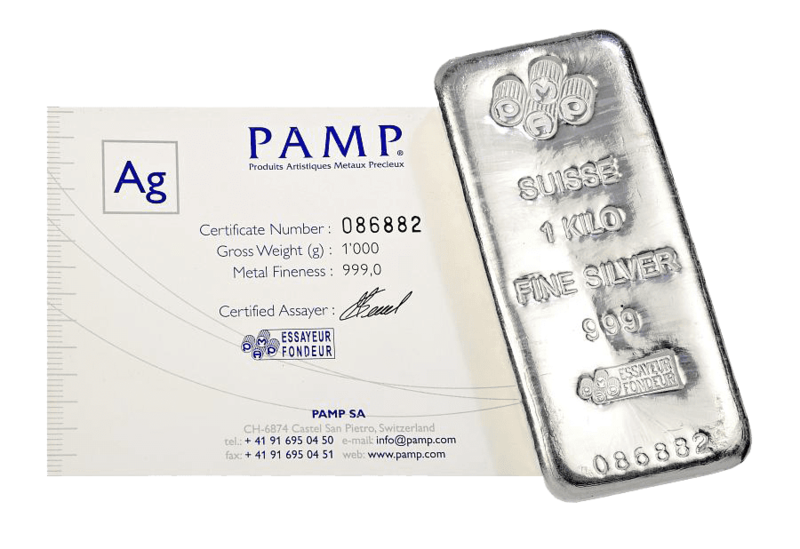 Silver has pulled back in the last 2 weeks, but history shows that there is likely to be more upside ahead in 2019 for silver. 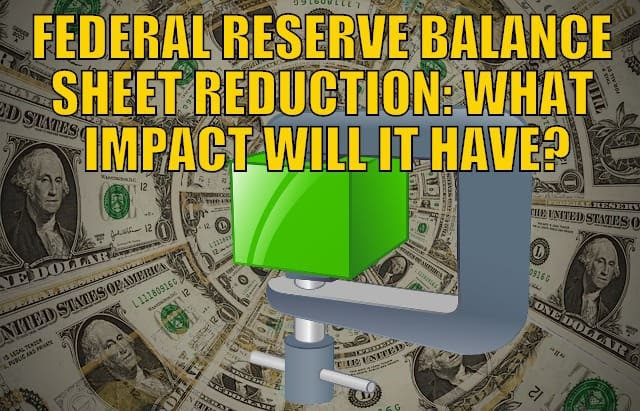 The post Federal Reserve Balance Sheet Reduction: What Impact Did it Have in 2018? What about 2019? 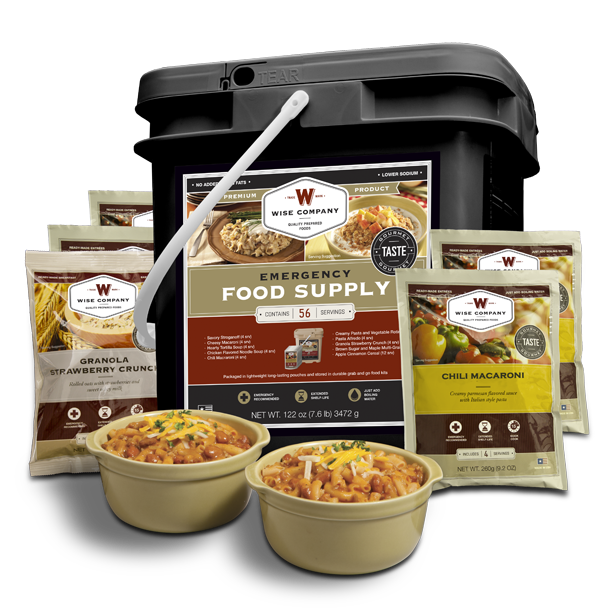 appeared first on Gold Survival Guide. 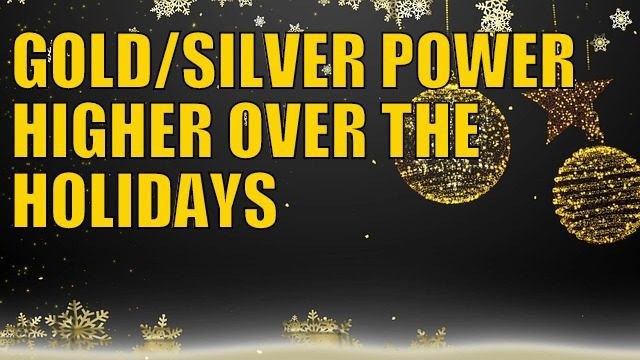 The post Gold/Silver Power Higher Over the Holidays appeared first on Gold SurvivalGuide. 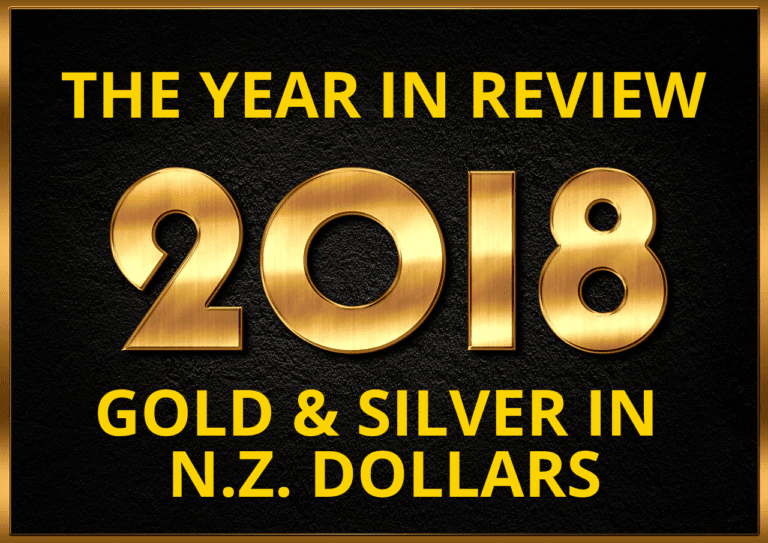 The post Gold & Silver in NZ Dollars: 2018 in Review & Our Punts for 2019 appeared first on Gold Survival Guide. 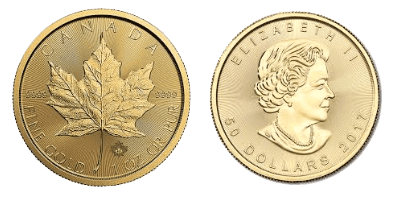 History Shows the End of the Year Great Time to Buy Gold and Silver Silver and the US Dollar: Will History Rhyme? 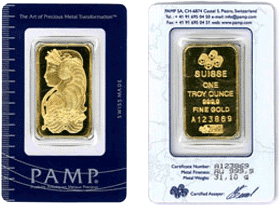 History Shows A Gold Bull Market Is Fast Approaching Could silver be worth more than gold? What does history say?